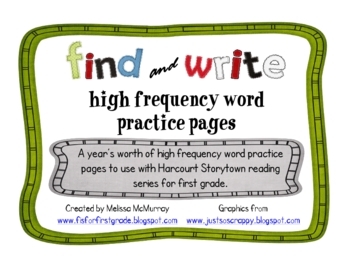 These 34 printable pages provide practice with high frequency words that go with the first grade Harcourt Storytown reading series. There are four pages that review words learned in kindergarten and then one page for each of the 30 weekly stories in the Harcourt reading series. 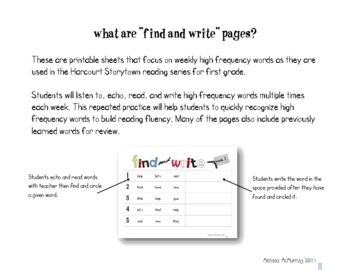 These practice pages give students the opportunity to hear you say the words, echo you, read with you, and write the words. This practice should lead to improved reading accuracy. 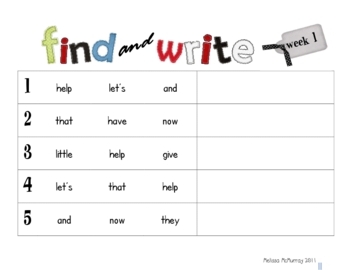 You can use these pages in whole group, small groups, or even in literacy stations. For my classroomn, I recorded my voice and put this activity in my listening station. There is a teacher script provided so you can see how I use these and to use if you want to record your voice as well.